The agreement marks a turn in Colorado River management. Senior officials from the United States and Mexico signed a broad five-year agreement on Tuesday that marks renewed cooperation over the Colorado River, a desert lifeline that provides water to at least 30 million people, irrigation to top agricultural counties, and electricity to millions — despite water demands in the last few years rising above the average annual supply. The pact, known as Minute 319, covers three key issues: it brings Mexico into existing U.S. water-management agreements for sharing shortages and surpluses; it allows U.S. states to pay for irrigation improvements across the border and reap some of the water savings; and it allocates water for the restoration of the Colorado River delta. 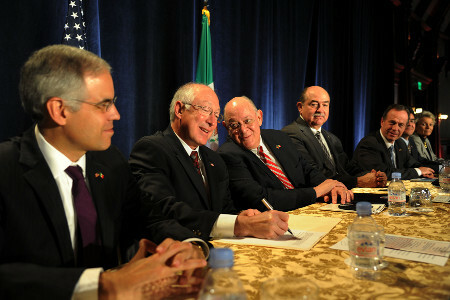 Interior Secretary Ken Salazar, second from left, and other agency heads from the U.S. and Mexico met Tuesday in Sand Diego to sign a major Colorado River water agreement. The abused Colorado River delta, which often does not hold enough water to connect the river to the Sea of Cortez, is one of the winners in the deal. Since 2008, a water trust led by Tucson, Arizona-based environmental group the Sonoran Institute has purchased water rights from Mexican farmers and kept the water in the river. Minute 319 requires water users in the U.S. and Mexico to provide a one-time high-volume “pulse” flow of 105,000 acre-feet, divided evenly, in addition to the base flows from the trust, which set a goal of 50,000 acre-feet over five years. Where water flows, a transformation should occur. Francisco Zamora, the director of the Sonoran Institute’s Colorado River Delta program, told Circle of Blue he hopes that the base flow from the water rights purchases, combined with the pulse flow, will create 810 hectares (2,000 acres) of new wetland habitat in the delta for fish, shrimp, and nearly 400 bird species. The flows will lay the groundwork for more extensive restoration projects. Other restoration experiments are taking place upstream. On Monday, the Bureau of Reclamation, which manages the largest dams on the river, opened the gates at Glen Canyon Dam in Arizona for a high-volume surge of water designed to mimic the floods that occurred before the river was dammed. It is the fourth such release and first since 2008. Minute 319, which amends the 1944 treaty that gave Mexico rights to roughly 10 percent of the river’s average annual flow, builds on a deal brokered two years ago that allowed water districts in Mexico to store water in U.S. reservoirs while rebuilding irrigation infrastructure destroyed in a magnitude 7.2 earthquake in April 2010. Those water-storage terms have been expanded. Mexico can now bank its water in Lake Mead during dry periods in order to keep the reservoir from dropping below levels that would trigger water restrictions for Arizona and Nevada. According to Minute 319, Mexico will now be affected by those restrictions and would see a cut in water deliveries if Lake Mead’s surface elevation were to drop below 1,075 feet. At the same time, water districts in Arizona, California, and Nevada will invest $US 10 million to patch up leaky canals and improve otherwise inefficient irrigation infrastructure in Mexico. In return, the water districts will split 100,000 acre-feet of Mexico’s water allocation over five years. That much water is equal to the annual demand of the 709,000 people served by Tucson’s water utility. The deal comes just before the Bureau of Reclamation is to release a comprehensive study showing that water demand in the Colorado River basin will exceed supply by as much as 25 percent in 2060. Michael Connor, commissioner of the U.S. Bureau of Reclamation, said after the signing ceremony that the agreement helps show the way to getting water use in the basin in line with supply.